By Tim Royner: Amir Khan (31-4, 19 KOs) can’t afford to fight with his emption next Saturday against Phil Lo Greco (28-3, 15 KOs) says promoter Eddie Hearn, who is worried about him coming unglued if he starts slugging with the Canadian fighter early on. Khan is fighting for the first time in two years against his hand-picked opponent Lo Greco, and there’s a lot of doubt whether he’ll be the same fighter he used to be due to the long layoff. It’s not just the inactivity for Khan that has boxing experts questioning whether he still has anything left in the tank at this point in his career. It’s the vicious knockout Khan suffered in his last fight against Saul ‘Canelo’ Alvarez on May 6, 2016. Khan was knocked unconscious by Canelo in the 6th round of that fight, and it might be a sign that it’s over for him. “He really believes he’s going to chin Amir Khan,” Hearn said to IFL TV about Lo Greco. “It’s kind of a no-win for Amir. Everyone is expecting him to win. The only way he can win is to come out and look unbelievable. To do that after a couple years out after that defeat in looking for an impressive performance for Amir Khan [won’t be easy],” Hearn said. Khan is upset with Lo Greco for him bringing up his wife during their press conference last January. Khan says he wants to punish Lo Greco for the things he said. Khan already threw a glass full of water in Lo Greco’s face during that press conference. But he now wants to give him a thrashing when he gets him inside the ring on April 21. That’s not a good thing for Khan to try, because if he fights with emotion instead of his head, he could leave himself open for one of Lo Greco’s heavy shots. Lo Greco has enough power to knock Khan out just like Danny Garcia, Briedis Prescott and Canelo all did. Lo Greco has respectable punching power, and a good chin. He took a lot of heavy shots from Errol Spence before crumbling in the 3rd round of their fight in June 2015. The punches that Lo Greco took in the first two rounds by Spence likely would have knocked Khan out straightaway if he had been hit by them. Hearn wants to make the Khan vs. Kell Brook fight for later this year. It’s ultimately up to Khan whether he wants to do that fight this year. Although Khan had previously talked of wanting to do the Brook fight, he’s now all over the place talking about wanting to fight other fighters like Manny Pacquiao, Errol Spence Jr. and Keith Thurman. Hearn might have to rein Khan in if he wants to have him face Brook this year. That’s a fight that will be tricky to make in terms of the weight. Brook is now fighting at 154, and he puts on a lot of weight after he rehydrates. If Brook has to come down to 147 for the Khan fight, he could wind up weight drained, and that’s even if he can make the weight. The last time Brook fought at 147, he was stopped in the 11th round by Spence last year in May. Khan had a terrible time when he moved up to 155 to fight Canelo at a catch-weight for his WBC middleweight title in 2016. Of those fighters, only Collazo was a true welterweight. Alexander, Algieri and Diaz are all fighters that fought in the light welterweight division. They weren’t true 147 lb. fighters. ”Because of his popularity in America, everyone is getting on him to make a fight,” Hearn said. ”[Top Rank president] wants him to fight Crawford. Haymon’s guys want him to fight Spence. There are a lot of options out there for him. Manny Pacquiao is fighting Matthysse. Amir Khan is a big name, and many feel he’s beatable because of his past. Amir also has the ability to beat those guys as well, after we see what he’s got left next week,” said Hearn. I don’t agree that Khan has the ability to beat Spence or Crawford. Hearn is a little off. There’s a possibility that Khan could beat the faded Manny Pacquiao, who will be turning 40 in December. Pacquiao is vulnerable, but Khan would be out of his league if he were to face Crawford or Spence. I imagine that Hearn would resist with all his might making either of those fights for Khan. 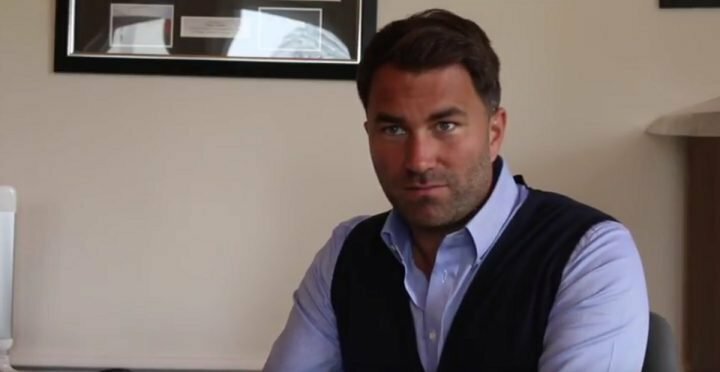 Hearn seems more interested in just making the Khan vs. Brook fight. It’s likely that if Hearn gets his way and makes that fight, he’ll look to stage a rematch straightaway for early 2019. That’s the type of fight that might call for three or four fights depending on whether their competitive or not. Hearn doesn’t have anyone else in his Matchroom Boxing stable to match Khan against. He can’t have Khan move up to middleweight to fight Daniel Jacobs. ”I’m not saying Phil Lo Greco is Keith Thurman or Errol Spence, but he can fight,” Hearn said. ”He’s had a 14-week camp, and he’s in great shape and he’s coming to win. Next week, Phil Lo Greco is going to do everything he can to try and get under the skin of Amir Khan, and Amir already wants to punish him. If he loses his head in the fight, that’s when it becomes a dangerous fight. If he stays composed, he should win well. If he tries to back this guy up and lose his emotion in the ring, that’s when it becomes a dangerous fight,” Hearn said. Lo Greco has a real chance of winning this fight if he can get to Khan’s chin early enough. If Lo Greco can’t get to Khan by the 4th round, his chances of winning will decrease rapidly. Lo Greco will wind up taking a lot of punishment if the fight stretches into the second half.